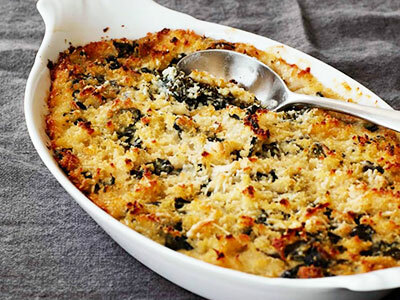 This stunning vegetable gratin makes a filling side dish. 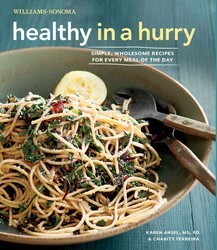 From Williams-Sonoma Healthy in a Hurry. 2. In a bowl, stir together bread crumbs, cheese, and 1 tablespoon of olive oil until well blended. Set aside. 3. Heat remaining 2 tablespoons olive oil in a large frying pan over medium heat. Add garlic and cook, stirring constantly, until fragrant but not browned, about 1 minute. Add kale and sprinkle with salt. Stir until kale is wilted and coated with oil. Add 1/4 cup (2 fl. oz.) water, cover, and steam until tender, 6–10 minutes, depending on age of kale. Transfer to a shallow gratin dish and smooth top. Sprinkle with bread-crumb mixture. 4. Bake until bread crumbs are golden brown, about 15 minutes. Let cool slightly, then serve right away. Note: Try this approach with any hearty vegetable when you have leftover good-quality bread: slice it, toast it, and then whirl it in the food processor to make coarse fresh breadcrumbs. You can also divide the mixture among heatproof ramekins to make individual servings. With over 100 accessible recipes and tons of practical advice, this cookbook shows busy cooks how to incorporate nutrient-packed foods into every meal of the day for optimum nutrition and well-being. This solution-oriented cookbook targets 30 super healthy foods and shows you how to make the most of them in delicious dishes, any time of the day. Karen Ansel, MS, RD, is a registered dietitian and freelance writer specializing in health, wellness, food, and nutrition. Her work has been published in national women’s heath magazines such as Family Circle, Woman’s Day, Cooking Light, Fitness, Prevention, Shape, Weight Watchers, Natural Health and Marie Claire. Charity Ferreira is a food writer, recipe developer, and former pastry chef whose work has appeared in Gourmet, Cooking Light, Sunset, and Bon Appetit, as well as the food section of the Los Angeles Times. She is the author or co-author of five cookbooks.